This block contains some double frilled really antique lace which I hope doesn't disintegrate in a hurry plus a small circle of linen which came as part of a sheet of twenty circles, all hem-stitched around ready for crocheting an edge . 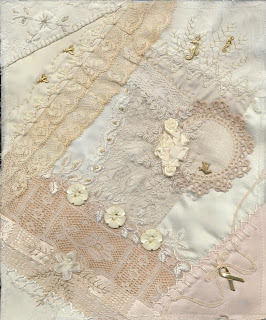 I stitched an edging of vintage tatting and added the ribbon roses to cover the join in the tatting. This is the block which gave my husband and me such a puzzle when we came into the bedroom at night to see a row of tiny bright lights glowing on the bed. We turned on the lights and all that was on the bed was this unfinished block and some threads where I had been sewing earlier in the day. Turned out the lights again and there were the little shining lights again. I put my hand on the lights and discovered that I had embroidered a row of stitching on the block in GLOW-in-the-DARK Kreinik thread. What a laugh!! We cracked up laughing because it was so funny to think we had actually wondered what on earth the lights were....duh!! The Glow-in-the-DARK stitches are the Pistil stitches and French knots between the Chain stitched scallops above the two rows of frilled lace.